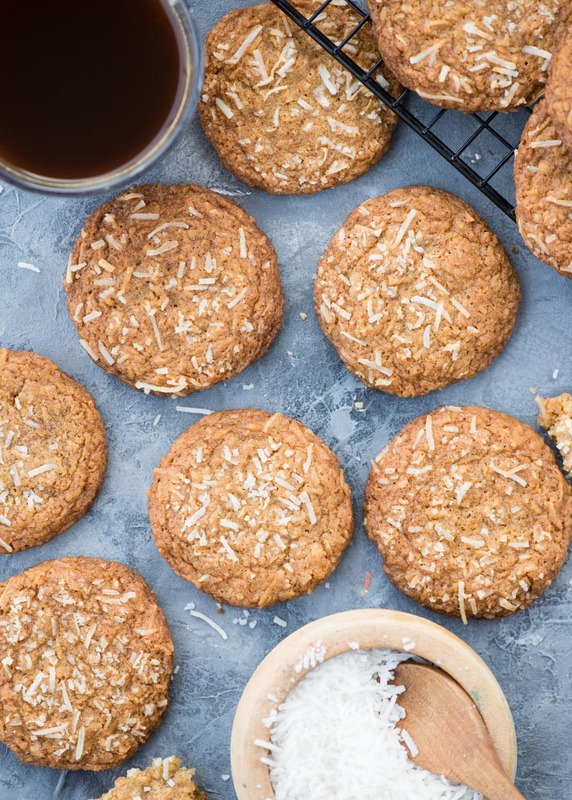 Chewy Coconut Cookies with Brown Butter has a nutty flavour from Brown butter and toasted Coconuts flakes. 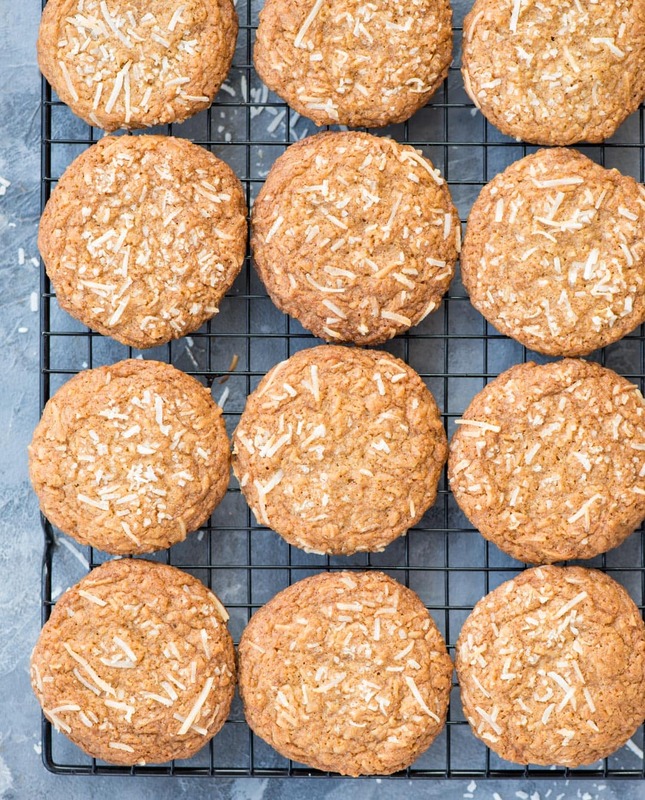 These easy to bake Coconut Cookies have a crispy edge and a soft chewy centre. 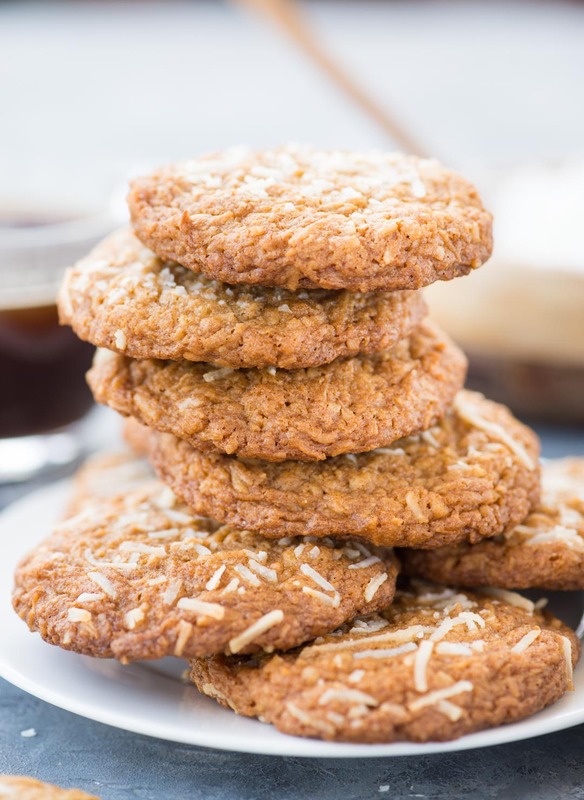 Incredibly delicious and addictive Coconut Cookies are easy to bake at home. Guys I am not talking about any dry boring Coconut Cookies here. 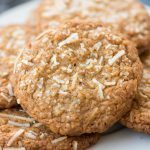 These are cookies have nutty flavour from the toasted coconut flakes and brown butter. Soft and Chewy cookies with crispy edges, just the kind of cookie you would love dunk in a glass of milk. This holiday season I am all set to try cookies that I have never baked before, like these Soft Eggnog Cookies. Different in flavour and texture. I have two more interesting cookie recipes coming soon that you don’t want to miss them. There is loads of flaky coconut in here. More coconut means chewier cookies. Use shredded coconut flakes, not coconut flour. Toasting coconut until golden brown and adding to the cookies makes a lot of difference. Butter is browned until it is nicely golden brown in colour and has a nutty aroma. This step might seems an extra effort, but believe me, brown butter takes the cookies to next level. I have used a mixture of brown and regular sugar here. The caramelized flavour of brown sugar adds lots of flavours and due to its higher moisture, content adds chewiness to the cookies. Then there is flour, baking powder, vanilla extract, eggs in this recipe. I want to mention two more ingredients here large pinch of cinnamon and a pinch of salt. Do you add a pinch of salt to your cookies?? If not I would suggest adding just a pinch of it, and you can see the difference. Cinnamon is optional but I like a hint of cinnamon in these cookies. Start with browning the butter. You can either brown it in a microwave or on the stovetop. Be careful while browning the butter, keep a close eye towards the end to avoid burning. Remove from the flame, once it turns light brown in colour. It will brown further with the remaining heat. If you are afraid the butter is browned a little too much, then immediately place the container in a batter bath. This helps in faster cool down. Let the butter cool down completely before you start baking. Toasting coconut can be done either on a skillet or in the oven. If you are toasting coconuts on the stovetop, then toast it in low flame. Stir in between to avoid burning but don’t over stir else the flakes would break. Keep all the ingredients at room temperature. Make sure you use fresh ingredients. The dough needs to be chilled for 15-20 minutes before baking. They spread quite a bit when baked, so for thicker chewy cookies chilling dough is required. The cookies are chewy and soft at the centre. When the cookies start to brown around the edges, remove the cookies. Once the cookies cool down, the texture will be just perfect. Avoid overbaking the cookies. I love to have these cookies when still warm. You can freeze the dough once shaped into balls. Place the shaped balls in a try and pop it into the freezer. When the balls are frozen put them in a freezer friendly bags. I like to roll the dough in shredded coconut for that extra crunch in every bite. If you are wondering if you can add chocolate chips to it, of course, you can. But I prefer them plain. 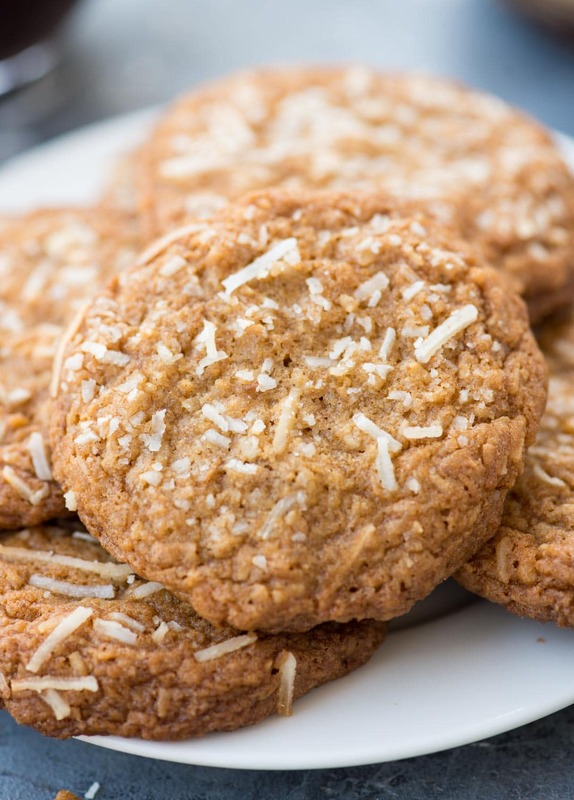 These Coconut cookies stays well at room temperature when kept in an airtight container. Toast coconut and let it cool. If using Oven, spread coconut flakes in a single layer and bake at 180 degree Celsius for 7-8 mins. Or on Stovetop toast it under low flame until light golden brown in colour. Let it cool. Brown butter on stovetop or in the microwave until it is light golden brown in colour and it starts to smell nutty. Towards the end of browning keep a close eye and avoid burning. Let the butter cool completely. In a mixing bowl add cooled brown butter, brown sugar and regular sugar. Whisk until creamy. Add egg, egg yolk and vanilla extract. Whisk well until well incorporated. Scrap the bottom of the bowl in between. In another bowl add all the dry ingredients except toasted coconut. Add dry ingredients in two batches to the wet mixture. Whisk just until the dry ingredients in mixed. Cover and chill the dough for 30 minutes. The dough should not be very hard. While the dough is chilling, preheat the oven at 180-degree Celsius. Scoop chilled cookie dough using a tablespoon. 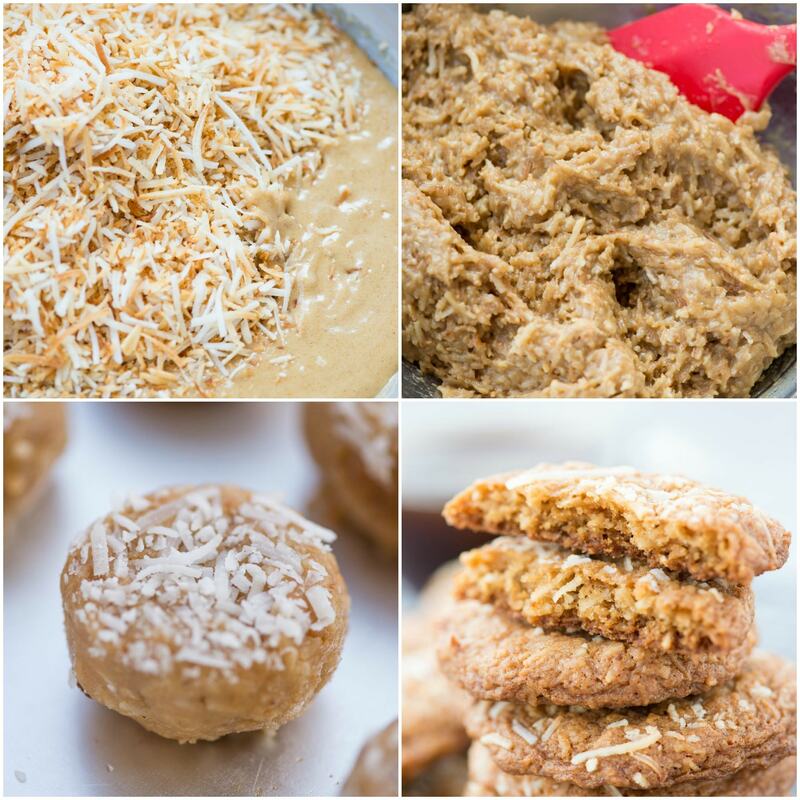 Roll scooped cookies dough in shredded coconut and coat it well. Gently press the coconut flakes to stick them properly. Bake it for 10-12 minutes at 180-degree Celsius. Once baked, let the cookies rest in the tray for 5 minutes. Then transfer the cookies to a wired rack and let it cool completely.